Mark has been exchanging e-mails with another property owner in North Carolina for another potential reintroduction. These would be Sarracenia rubra, S. flava, S. purpurea, Drosera capillaris, and Dionaea muscipula that we have in our ex-situ conservation program sourced from nearby this location. More information will be available soon as we continue our discussions with the land owner. Vic will look into what needs to be done in order to fulfill a seed request for a member in Australia. A motion was made to amend the growers agreement to bring it in line with our recent conversations on what growers can and cannot do with additional plant propagules after meeting NASC goals. Vic proposed the updated document. After a brief discussion, a vote was taken and it was unanimous to adopt the changes. The updated document will be posted shortly and the changes will be summarized on the main page of our site. A motion was made to nominate Heather Williams as the Secretary to fill the vacant seat. The motion was seconded and Heather accepted the nomination. The motion was put to a vote and passed unanimously by all attending Board members. We welcome Heather Williams and thank her for stepping into the Secretary position! We look forward to working together. Guests: Warren, Zuzanna – Welcome! Thank you to California Carnivores for working with us regarding the Save a Flytrap project! What winter? Sarracenia leucophylla in Pensacola, Florida in January 2013. Standing in the wetlands of Pensacola, Florida earlier this month boot-deep in muck and probably deeper than usual water – it had been raining heavily the past few weeks though the rain held off just long enough to complete the task at hand – it was sometimes difficult for Mark, Sheila, Victor, and Mason to decide which hundred plants or so among thousands were worth prying loose from the soil. They were there with the North American Sarracenia Conservancy, making hopefully objective decisions on which new Sarracenia on these 40 acres to collect for our ex-situ conservation and propagation program. The volunteers asked themselves, what represented a good sample? Which plants represent unique genetic lineages? No, we don't want to load up on too many of the same clone. Spread out over the property and make sure we sample broadly, but efficiently. 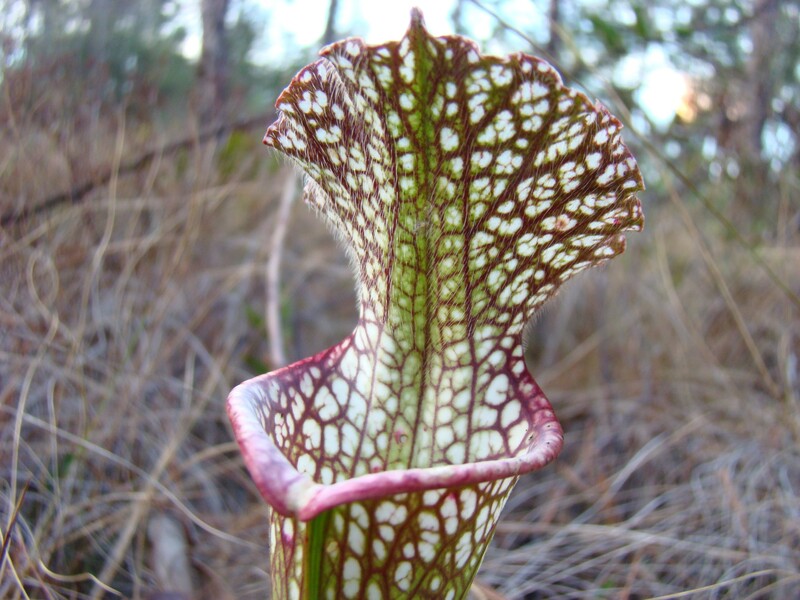 There are three species of Sarracenia, the genus of North American pitcher plants, on these properties: in order of decreasing absolute population, Sarracenia leucophylla (white pitcher plant), S. psittacina (parrot pitcher plant), and S. rosea (Burk's southern pitcher plant); in what proportion do we sample each species? How do we perform this work in the most environmentally sensitive way? 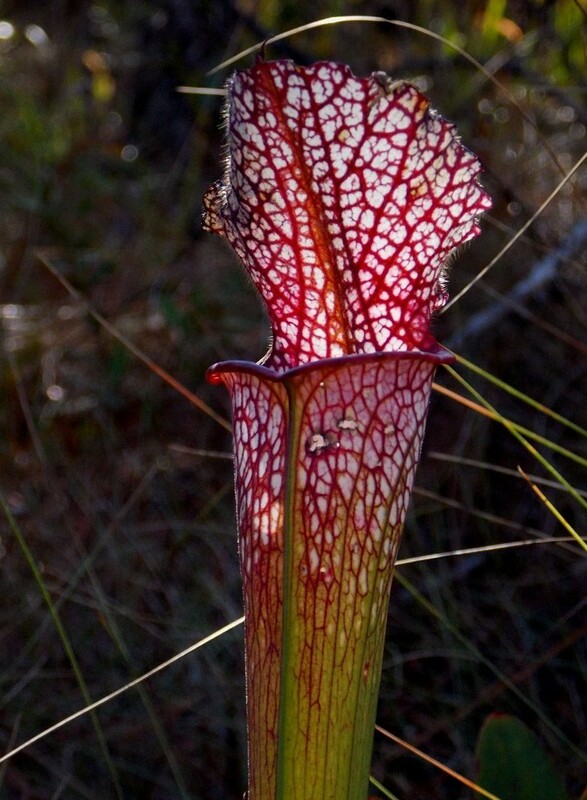 Sarracenia rosea at the site in Pensacola, FL. Photo by Mark Todd. It was as early as five years ago that NASC treasurer Sheila Stewart first saw and admired the plants on these properties in Pensacola. 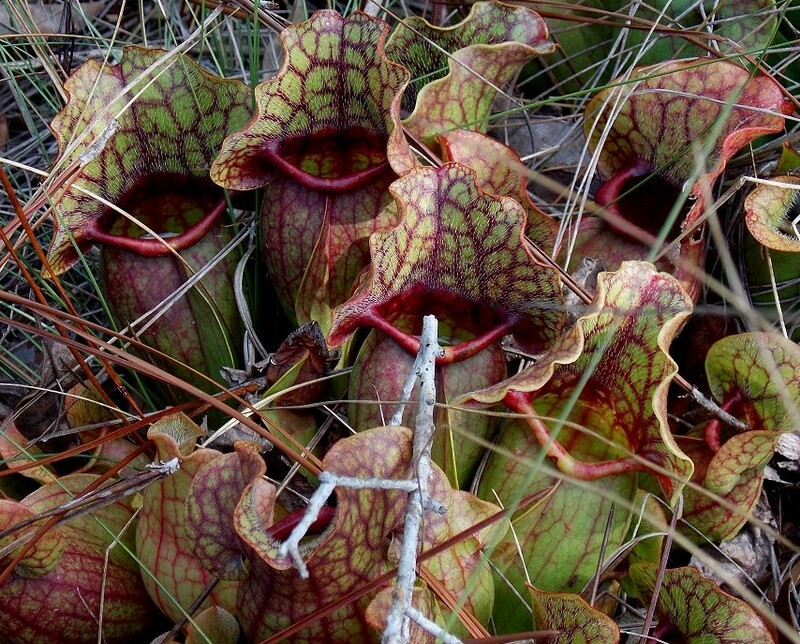 The panhandle of Florida, if you're unaware, is a fairly species rich area for carnivorous plants and is home to several threatened or endangered plants, including the state-endangered S. leucophylla. Sheila became concerned about the future of the site in October 2011 after a few years of seeing nearby rapid development; the for-sale signs that recently sprouted on the properties that contained the Sarracenia worried her that much more. Sheila feared this meant a swift sale and then development, so she approached the NASC Board of Directors in October 2011 and we began pursuing our options soon after. Hovering over a clonal clump of pitcher plants in the wetlands in Pensacola looking for the best angle of attack to cleave off a small sample so that the remainder is left healthy and undisturbed, our volunteers must have been thinking about the ultimate destination of these plants. We had negotiated a contract with two different property owners and the plants would be placed with individual growers who had demonstrated experience and had applied to grow plants for us on the grower committee. These plants will be propagated as rapidly as possible by rhizome divisions or by seedlings and then used for reintroductions to areas identified by The Nature Conservancy of Florida and the Weeks Bay Foundation relatively near the site of collection. Our volunteer readies his equipment after all this contemplation, the shovel hits its mark, and a subset of the Sarracenia rhizomes are liberated from the mother clump and then unceremoniously placed into a labeled plastic bag for safe keeping until it can be cleaned, sorted, and shipped to one of the volunteer growers across the country. S. leucophylla at the site. Photo by Mark Todd. While the properties do remain for sale and could be developed by the potential new owners ... we are thoroughly impressed with Escambia County’s commitment to the retention of wetlands and threatened and endangered species within them as a public good. This means, of course, that the great news is that the NASC is confident that the plants will be able to remain on the properties in their original habitat, which is one of our primary goals. This means, however, that our commitment to TNC of Florida and the Weeks Bay Foundation remains unmet. So earlier this month, three North American Sarracenia Conservancy Board members and one volunteer member traveled to Pensacola, Florida and, with the generous permission and cooperation of the property owners and the relevant government agencies, the members worked over several days to ensure a broad sample of Sarracenia, collecting about 100 plants of the estimated 5,000 plants on the two properties. This material was distributed to a half dozen dedicated and experienced growers who will spend the next few years attempting to make thousands from what was but a hundred so that we may honor and fulfill our commitment to TNC and the Weeks Bay Foundation. Oh, and we're not opposed to having a bit of fun while we work. 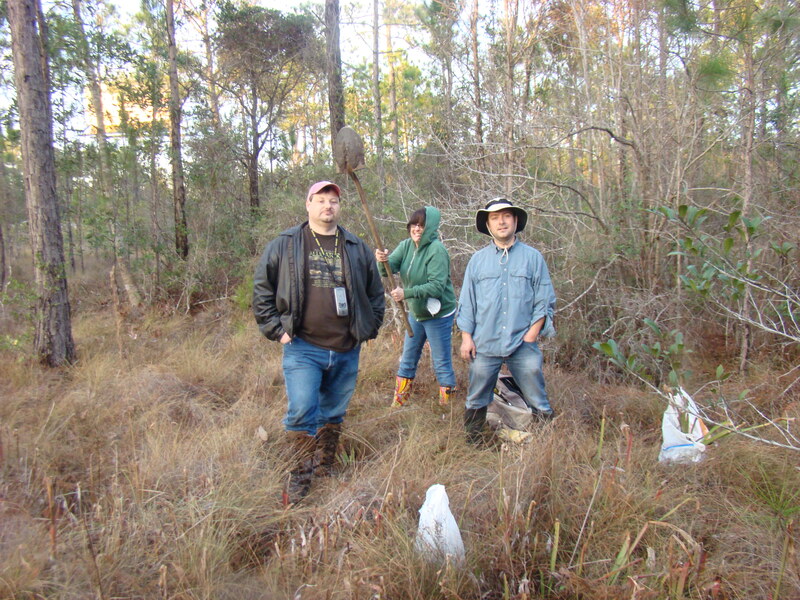 Mark Todd, Sheila Stewart, and Victor Holland in Pensacola collecting a sample of Sarracenia. Lesson learned: Never turn your back on Sheila. Photo by Mason McNair. This collection could not have been possible without the hard work and dedication of so many. To those of you who had initially stepped forward to volunteer your time for the relocation and reintroduction prior to the change in plans, thank you. Again, we would like to acknowledge the efforts of the Weeks Bay Foundation and The Nature Conservancy for working with us in the region. And last but not least, the willingness to listen to a non-local conservancy organization blather on about some carnivorous plants came naturally to the two property owners we worked with in Pensacola, as did their cooperation as our collaboration progressed. One wishes to remain anonymous but we thank them both ever so much: Anonymous and E.K. "Skip" Edwards from the TK Edwards Co Inc. Thanks to Mark, Vic and Sheila for going down to Pensacola and rescuing 100 plants from the rescue site! The trip has attracted much attention towards our growing program.